We fixed the neighborhood school, but what about the neighborhood kids? If you live in Portland and don’t apply to go to another middle school, your kids will be sent across town to either Westport or Kammerer Middle school by default. It’s not because the schools closest to the neighborhood are full, and can’t take any more kids. The 2019-20 enrollment projections for Western Middle, show a program capacity of 825 students, but a projected enrollment of 613, leaving space for 212 more students. The next closest middle school at The Academy @ Shawnee, shows a program capacity of 225, and a projected enrollment of 125 students, leaving space for 100 additional students to attend that school. So, there is space for 312 students at middle schools within our neighborhood, or right outside it. 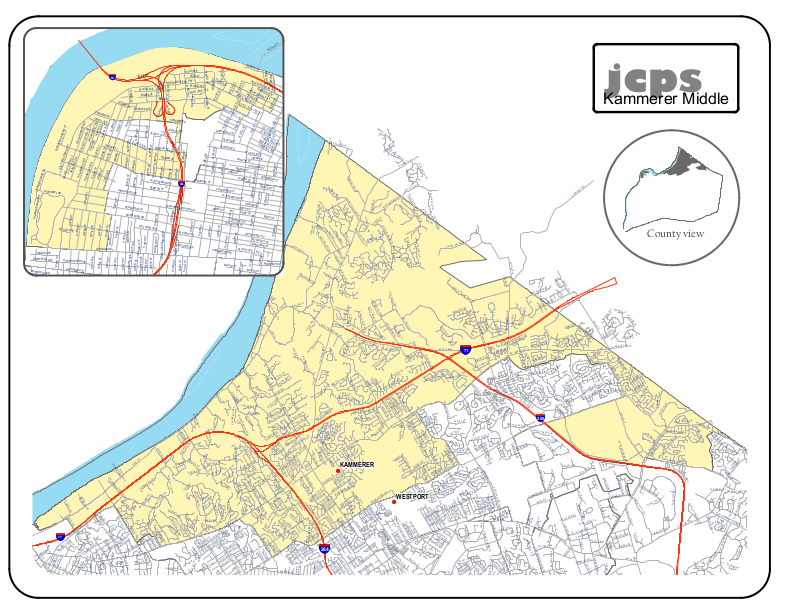 Westport Middle currently has 171 students from our neighborhood, and Kammerer Middle has 60. Those 231 students could easily fill the 312 empty slots in schools close to their own homes instead of passing 5 other middle schools on the way to their assigned schools. However, you must apply (and be accepted) to attend school at Western or Shawnee Middle schools. This wasn’t always the case, of course. Neighborhood kids attended Western Middle for generations until it was converted to a Magnet School around 2010. Western Middle by most accounts was plagued by serious issues and was not performing well by any standard. To avoid a state takeover of the school, it was converted to a magnet school and the neighborhood students sent to Westport or Kammerer, unless they applied to (and were accepted) to another school. With an influx of new, hand-picked, students Western Middle is now a thriving Magnet School for the Visual and Performing Arts, and avoided further scrutiny from the State. While we should certainly celebrate Western Middle’s successful turnaround, one has to wonder what the outcomes have been for the population of students who would have formerly attended there. 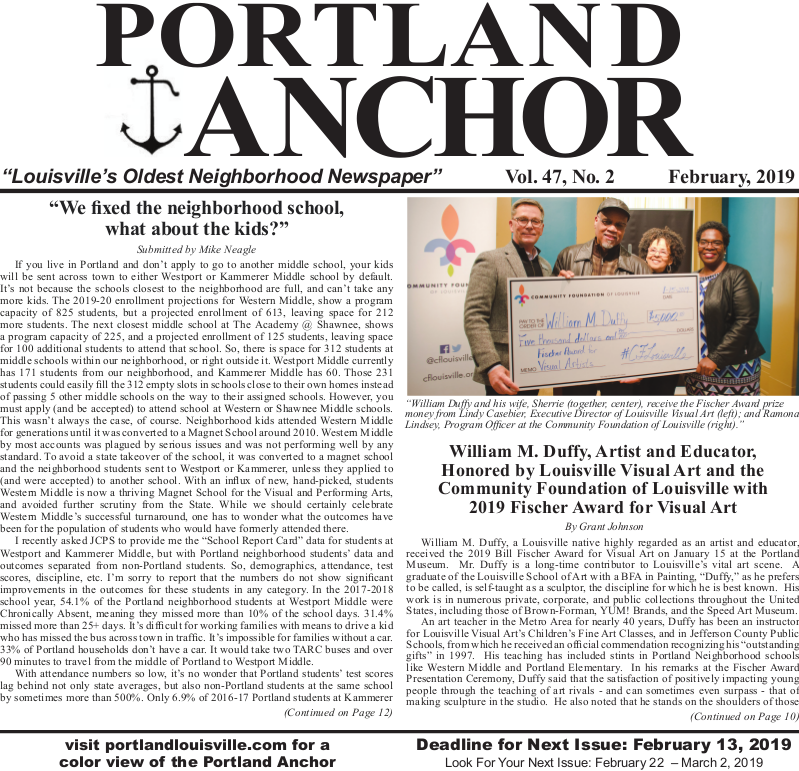 I recently asked JCPS to provide me the “School Report Card” data for students at Westport and Kammerer Middle, but with Portland neighborhood students’ data and outcomes separated from non-Portland students. So, demographics, attendance, test scores, discipline, etc. I’m sorry to report that the numbers do not show significant improvements in the outcomes for these students in any category. In the 2017-2018 school year, 54.1% of the Portland neighborhood students at Westport Middle were Chronically Absent, meaning they missed more than 10% of the school days. 31.4% missed more than 25+ days. It’s difficult for working families with means to drive a kid who has missed the bus across town in traffic. It’s impossible for families without a car. 33% of Portland households don’t have a car. 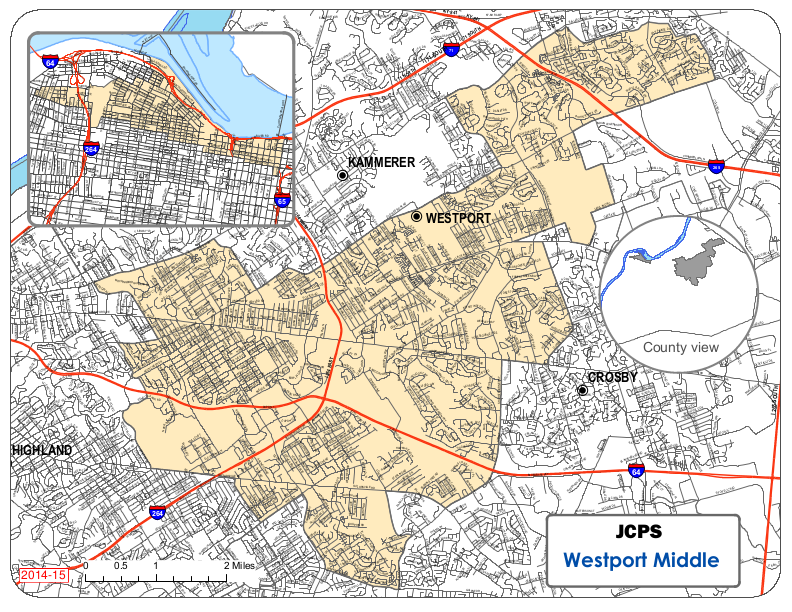 It would take two TARC buses and over 90 minutes to travel from the middle of Portland to Westport Middle. With attendance numbers so low, it’s no wonder that Portland students’ test scores lag behind not only state averages, but also non-Portland students at the same school by sometimes more than 500%. Only 6.9% of 2016-17 Portland students at Kammerer Middle achieved Proficient or Distinguished in Math, while 40.3% of the non-Portland students did. It almost seems as if the students were sent to larger schools in order to dilute their test scores so no one would notice. Since scores aren’t published by neighborhood, there was no way for anyone to notice. Outcomes at our neighborhood middle school have improved, but outcomes for many middle school students from our neighborhood have not. It’s easy to stand on the sidelines and point fingers at JCPS for engineering a system that seems like it was designed to set up our kids to fail. However, these kids presumably sit in the same classrooms and receive the same education as the kids that outperform them. What can the citizens of our neighborhood do to make education a priority in our neighborhood and help close that gap? Are you involved in your child’s education? Your grand-kids, nieces, nephews? Your neighbor’s kids? What is our neighborhood ready, willing, and able to do to improve the outcomes of all of our neighborhood’s students? If we, knowing what we know now, continue to stand by and watch the majority of our neighborhood children fail in school, we are complicit in their failure and have just as much blame as anyone else. No one is going to advocate for our neighborhood kids better than we can, and it’s time for us to start. 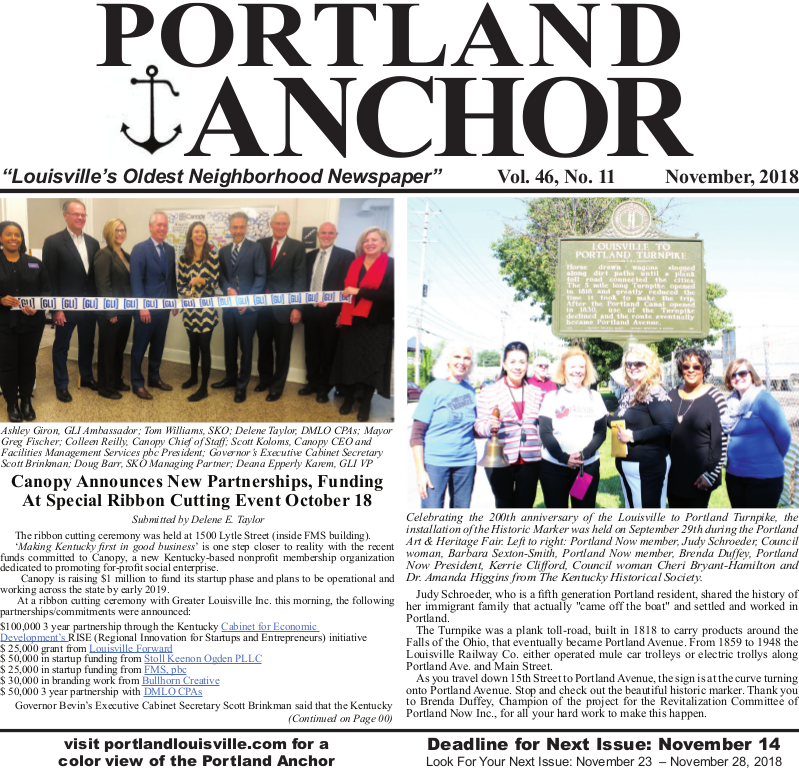 Over the past two months Portland Now, Inc. (PNI) has been working with several divisions and departments in Louisville Metro government to accomplish some important work our most visible corridors. Install a bench at 26th and Portland on the North side of Portland Ave. 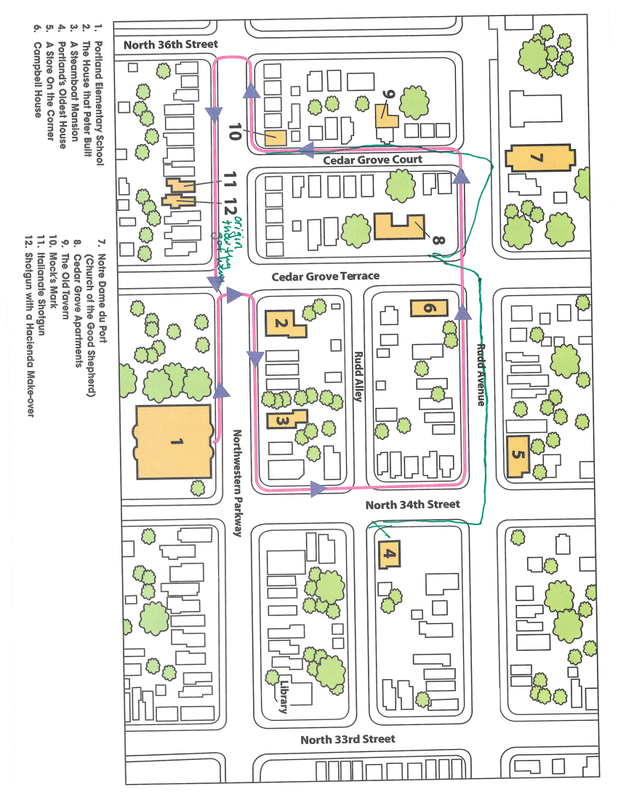 This is another step in the ongoing efforts of PNI to revitalize our neighborhood. You will probably begin to see work on these projects in the next weeks. 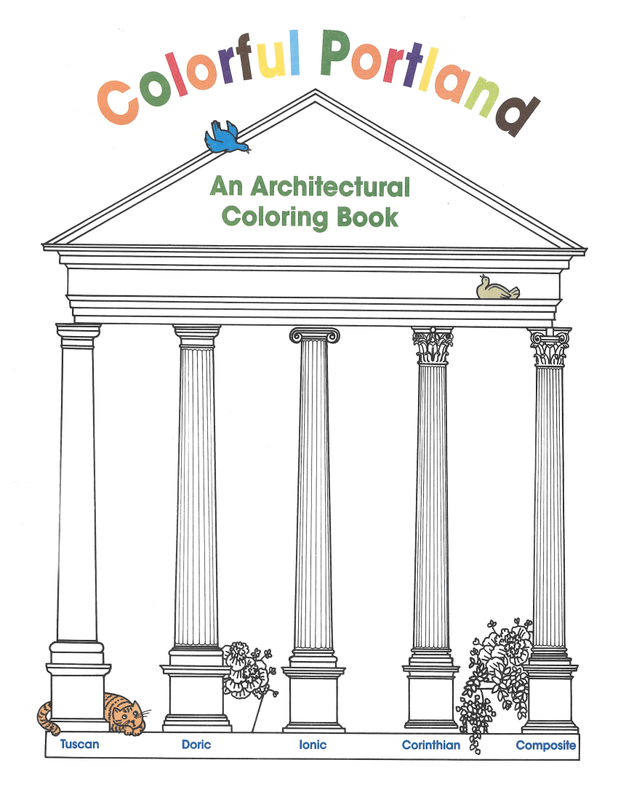 Coloring books are all the rage today! 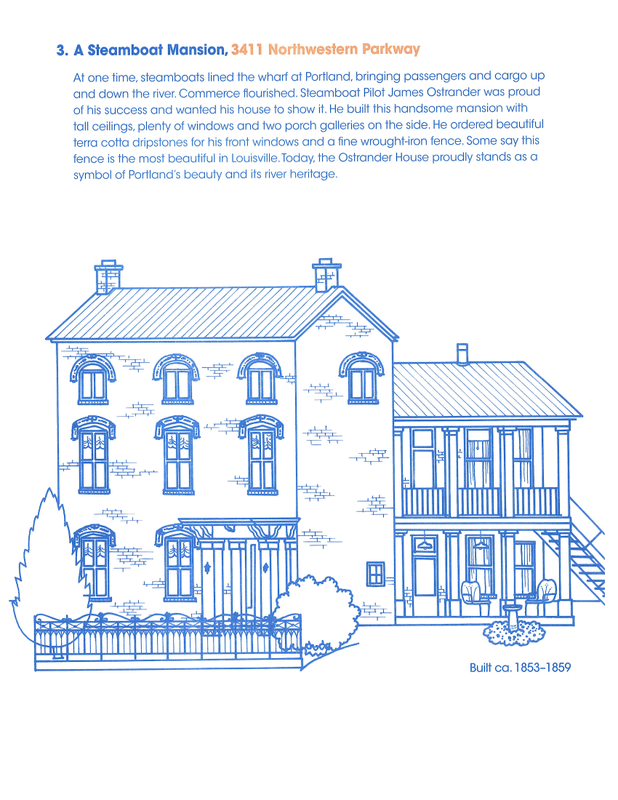 Color these pages while you learn about Portland’s Historic District! The Portland neighborhood is a colorful place with many types of people and many styles of buildings. On every street, you can find interesting buildings. Every house has a history. Every building has a story. 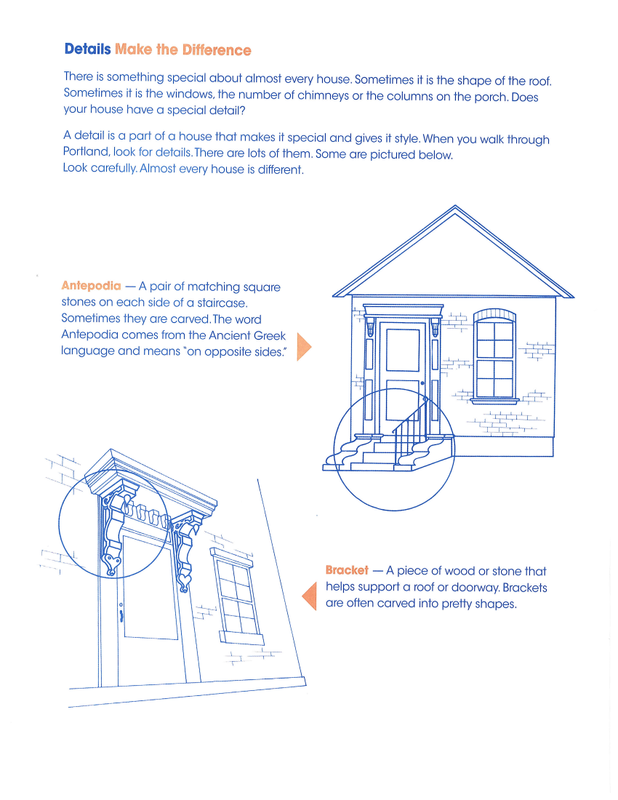 The neighborhood around your school is a Historic District because the buildings help tell the story of Portland. Buildings in the Historic District are unique and need special care to make sure they will be here for many years to come. 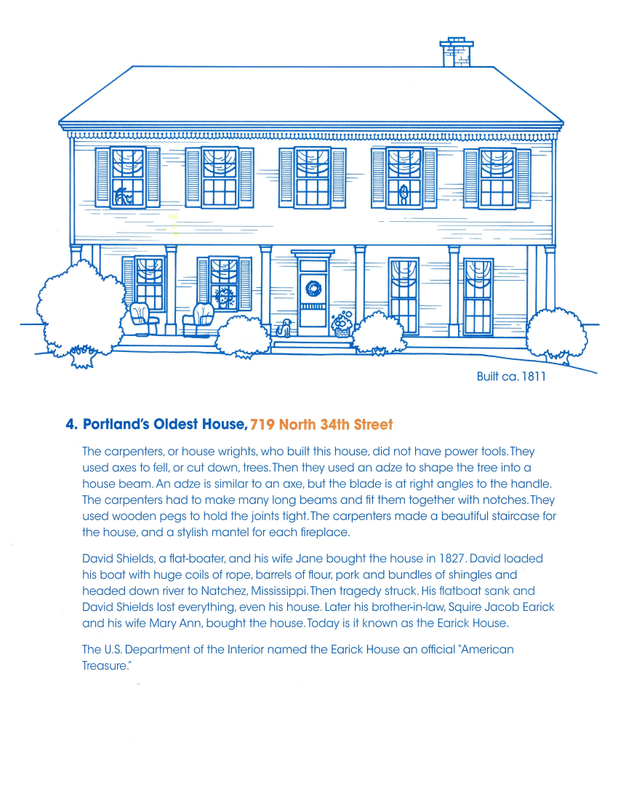 Use this book to discover the stories of 12 important buildings in the Portland Historic District. Your school is one of them. The buildings are close to your school. They are organized into a walking tour with a map to show the way. The map is on the back page of this book. Look for other special buildings and architectural details in Portland. See how colorful your neighborhood can be. This school is really two buildings, one inside the other. Together the two make Portland Elementary the oldest public school in Jefferson County, Kentucky. The inside building is old Portland Elementary, built in 1853. This little four-room school was enlarged in 1901 to serve more students. By 1967, the school needed more improvements such as better bathrooms, a bigger library, and more classrooms. School officials asked architect Jasper D. Ward to make the school bigger. He did this by wrapping a new building around the old one. Even later, a new gymnasium was added. Written by Caroline Aiken and Nathalie Andrews. Illustrated by Annette Cable. Published by the Portland Museum, 2308 Portland Avenue Louisville, Kentucky 40212 for Portland Elementary School with funds from JCPS in 1989. Re-issued with grants from Metro Louisville EAF and the National Trust for Historic Preservation. Copyright © Portland Museum, Inc. 2012. All rights reserved. 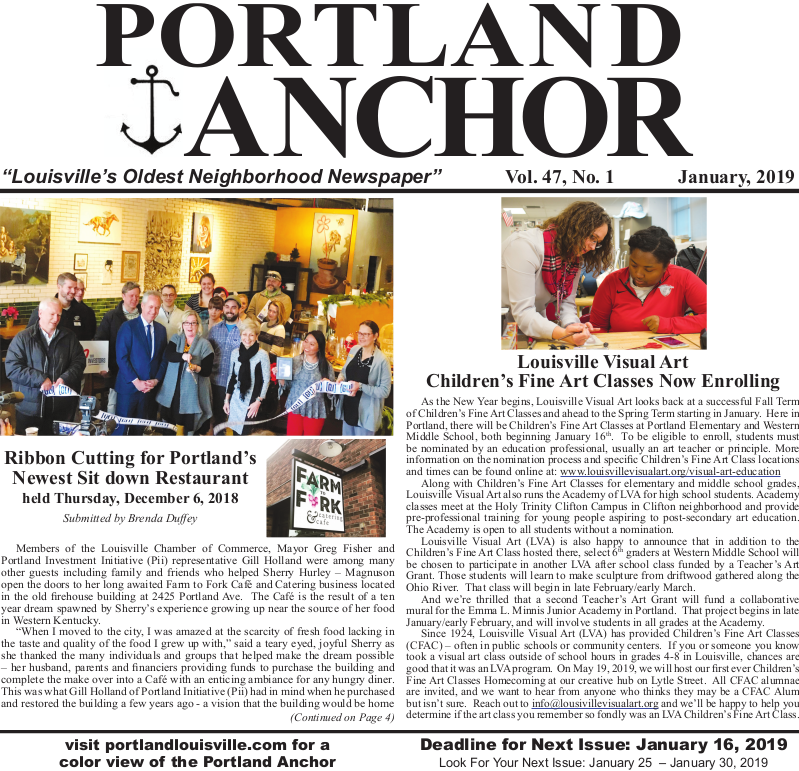 The Kentucky Arts Council, the state arts agency, provides operating support to the Portland Museum with state tax dollars and federal funding from the National Endowment for the Arts. Peter Portman, a wealthy grocer, and his wife Josephine had nine children and visiting relatives from Switzerland. They needed a big house and built this brick home at the time of the Civil War. Peter and Josephine chose the fashionable Italianate style with brackets along the roof, tall windows and rooms with high ceilings. High ceilings help keep a house cool in summer. Fireplaces kept it warm in winter. Shutters on the windows could be opened and closed to keep the temperature comfortable. Over the years, some details of the house changed. Look carefully. Do you see any brackets or shutters? At one time, steamboats lined the wharf at Portland, bringing passengers and cargo up and down the river. Commerce flourished. Steamboat Pilot James Ostrander was proud of his success and wanted his house to show it. He built this handsome mansion with tall ceilings, plenty of windows and two porch galleries on the side. He ordered beautiful terra cotta dripstones for his front windows and a fine wrought-iron fence. Some say this fence is the most beautiful in Louisville. 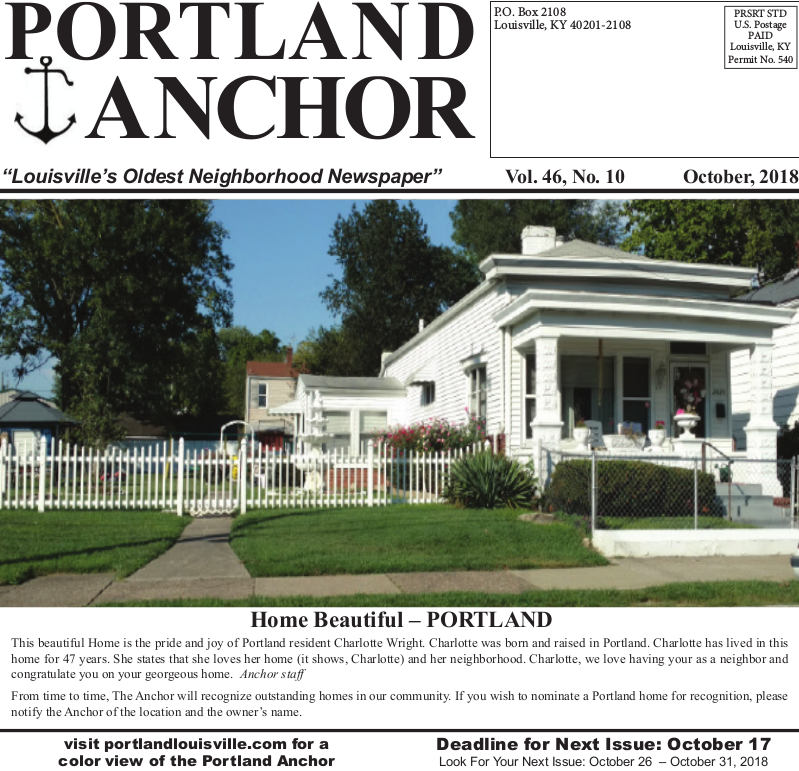 Today, the Ostrander House proudly stands as a symbol of Portland's beauty and its river heritage. The carpenters, or house wrights, who built this house, did not have power tools. They used axes to fell, or cut down, trees. Then they used an adze to shape the tree into a house beam. An adze is similar to an axe, but the blade is at right angles to the handle. The carpenters had to make many long beams and fit them together with notches. They used wooden pegs to hold the joints tight. The carpenters made a beautiful staircase for the house, and a stylish mantel for each fireplace. David Shields, a flat-boater, and his wife Jane bought the house in 1827. David loaded his boat with huge coils of rope, barrels of flour, pork and bundles of shingles and headed down river to Natchez, Mississippi. Then tragedy struck. His flatboat sank and David Shields lost everything, even his house. Later his brother-in-law, Squire Jacob Earick and his wife Mary Ann, bought the house. Today is it known as the Earick House. The U.S. Department of the Interior named the Earick House an official "American Treasure." Long, long ago, almost city block had a store on the corner. Some were general stores. Some were taverns and saloons. The design of a corner store is smart. The store had big windows and doors to attract customers. Upstairs, there was plenty of space for the owner's family to live. This corner store was built for Thomas Bannon and his family. The Bannon family lived here for more than fifty years. The handsome double doors on the side served as the family's front door. Look carefully and you can see another set of doors for people to visit the store. Later Kentuckiana Ornamental Iron Company occupied the building and the Iron Workers Union met upstairs. Today this corner store is divided into eight apartments. William H. Campbell, known as Billy Campbell, was an engineer on a steamboat that ran between Portland and New Orleans. A steamboat engineer was paid even more than a captain. So Billy Campbell could afford to build a fine home at the corner of 35th and Rudd. At the time, Rudd Avenue was named Market Street and Cedar Grove Terrace was named Ferry Street because it ran down to the Ferry landing on the river. This was a great location for a steamboat man to live. The Campbell house is a beautiful example of an Italianate Town House. The exterior walls are 12 inches thick. The windows are tall and the window and door hoods are handsome. Can you see the dentils over the windows? Look closely at the side porch with its beautiful cast iron railings. Beautiful cast iron like this was made in Portland at one time. Great steamboats carried the iron to New Orleans. 7. Notre Dame du Port (Church of the Good Shepherd), 3515 Rudd Ave.
As early as 1806, priests rode horseback to Portland to conduct services for the Catholic families that were settling here. As the town of Portland grew, so did its Catholic community. By 1839 the community was strong enough to build a beautiful brick church and name it Notre Dame du Port. This French name means Our Lady of the Harbor. The Church you see has been rebuilt twice but the steeple is original. Local brick masons fired, or made, the bricks right here on the land near the church. At one time, this entire city block was a beautiful school for girls. The Sisters of Loretto, an order of Catholic nuns, founded the school in 1842 to educate girls and young women. The school was named Mount Saint Benedict Academy but people called it Cedar Grove because the property had so many lovely evergreen trees. Students came from all over the South to live and study at the school. A low wall surrounded the campus where the Sisters maintained gardens, grape arbors, and large buildings. Mount Saint Benedict at Cedar Grove closed in 1925. The biggest building became Cedar Grove Apartments. On this four-acre site there stood a tavern, built in 1827 to serve river travelers and boatmen. Before there was a church in Portland, services were sometimes held on the second floor of the tavern. Later, four Sisters of Loretto came to live in the tavern. The nuns hired brick masons to make additions to the building. They founded a school and named it Mount Saint Benedict Academy. Soon gardens, walkways, a laundry, a chapel, and a large dormitory for students filled the four acres. Many years later a developer bought the land, the school, and the old tavern. He built new houses and put stucco over the brick to make it look Spanish. But, if you look hard, under the new stucco skin, you can still find the old brick building. In the 1925, Otto Mock, an architect, bought the school and the four acres of land now called Cedar Grove Terrace. He planned a development of new homes around the old school buildings. He called it Cedar Grove Beautiful. Otto Mock transformed the old buildings with stucco and Spanish details. Using a popular style called Tudor, he designed new houses. A Tudor-style house has high, steep roofs and decorative wood beams called timbers. The Cedar Grove section of Portland looks very different than the older buildings in the neighborhood, thanks to the architectural taste of Otto Mock. 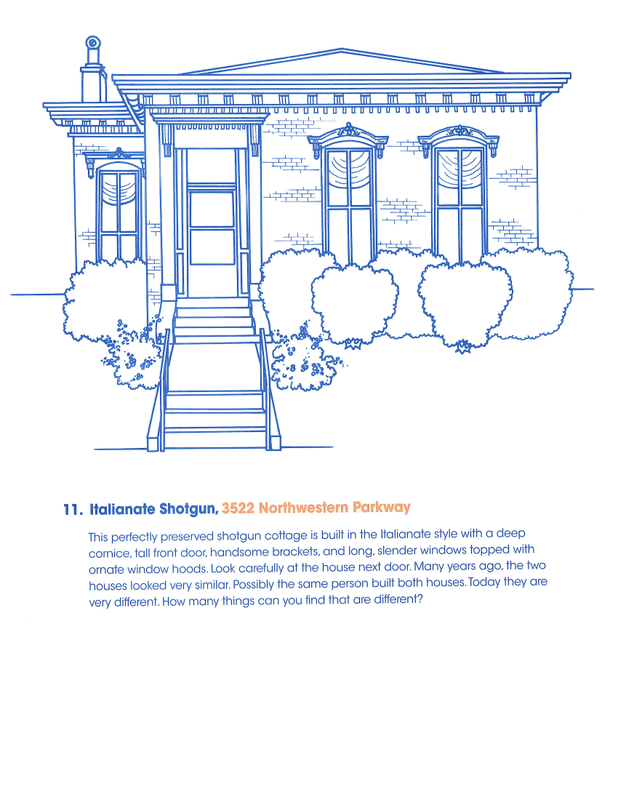 This perfectly preserved shotgun cottage is built in the Italianate style with a deep cornice, tall front door, handsome brackets, and long, slender windows topped with ornate window hoods. Look carefully at the house next door. Many years ago, the two houses looked very similar. Possibly the same person built both houses. Today they are very different. How many things can you find that are different? In 1925 big changes were happening at Cedar Grove. I wonder if the owner of this house looked across the street at the changes and decided to make similar changes to his home. What can you see that is the same as the house next door? Can you see that the shape of the windows is the same, but the window hoods have been removed? Do you see the brackets under the cornice along the roof? Look next door to see if they match! There is something special about almost every house. Sometimes it is the shape of the roof. Sometimes it is the windows, the number of chimneys or the columns on the porch. 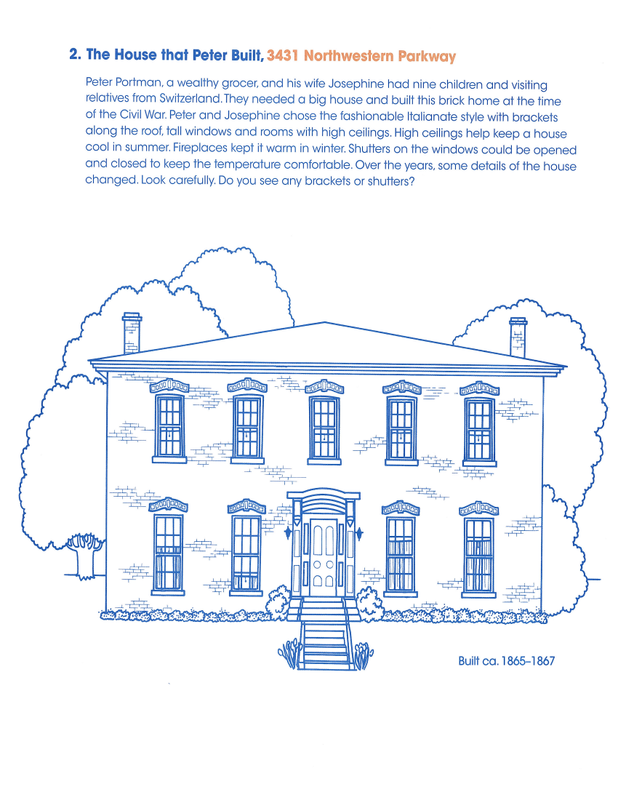 Does your house have a special detail? A detail is a part of a house that makes it special and gives it style. When you walk through Portland, look for details. There are lots of them. Some are pictured below. Look carefully. Almost every house is different. Antepodia - A pair of matching square stones on each side of a staircase. Sometimes they are carved. The word Antepodia comes from the Ancient Greek language and means "on opposite sides." Bracket – A piece of wood or stone that helps support a roof or doorway. Brackets are often carved into pretty shapes. Carpenter's Lace — Ornamental woodwork created by carpenters, especially after the invention of the scroll saw. Some shapes were inspired by decorations on steamboats. Column – A cylinder made of wood, stone or metal. Columns come in many styles and usually occur in a series, called a colonnade. Five classic styles of columns are identified on the cover of this book. 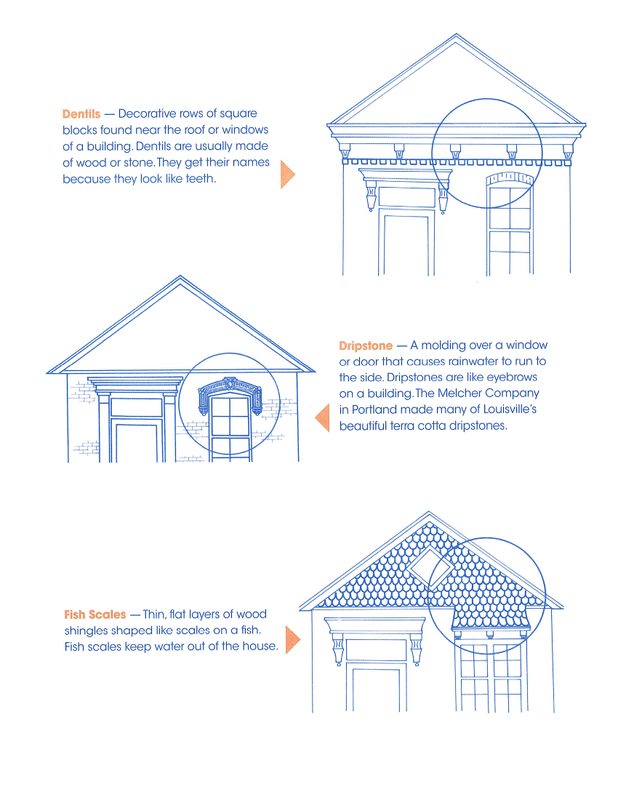 Dentils — Decorative rows of square blocks found near the roof or windows of a building. Dentils are usually made of wood or stone. They get their names because they look like teeth. Dripstone – A molding over a window or door that causes rainwater to run to the side. Dripstones are like eyebrows on a building. The Melcher Company in Portland made many of Louisville's beautiful terra cotta dripstones. Fish Scales — Thin, flat layers of wood shingles shaped like scales on a fish. Fish scales keep water out of the house. Ironwork – There are two basic types of ironwork, cast iron and wrought iron. Cast iron is heated to a liquid and poured into a mold. Wrought iron is hammered into shapes by a blacksmith Portland had many beautiful iron fences and porch railings. During World War II, citizens were asked to contribute iron to the war to be melted for armaments. Many of Portland's iron fences disappeared at that time. Shutter – A hinged cover for a window. Shutters are usually made of wood and come in pairs. They help keep out the sun, wind and rain. Spindles — Short, round ornaments used as spacers between wood. Spindles are made on a machine called a lathe. A book published by the Masonic Lewis Lodge #191, celebrating their first 100 years. 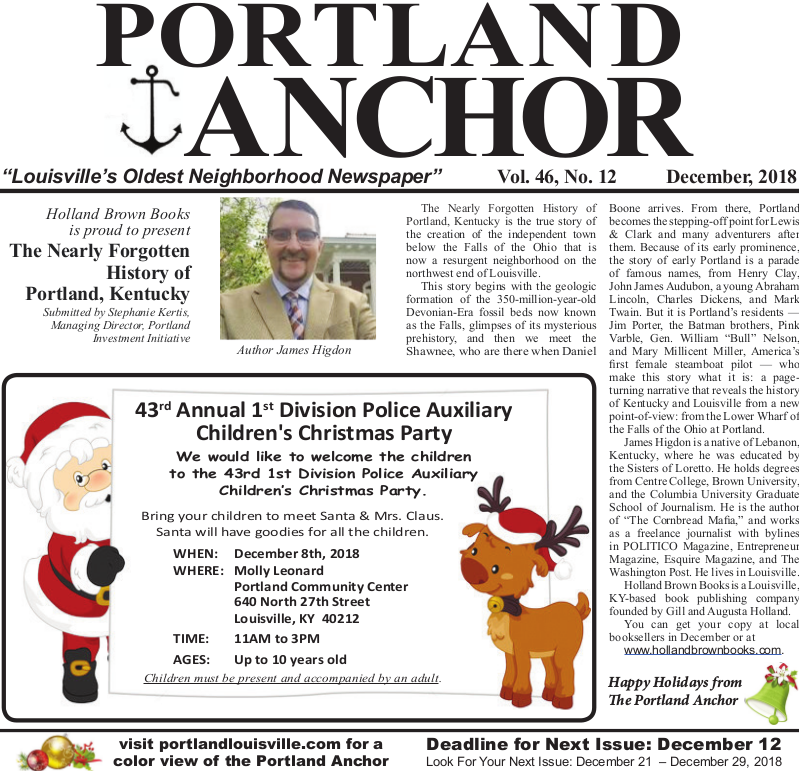 Contains lots of information on the history of Masonry in Kentucky, and information about the history of Portland, its residents, and the Lodge built at 537 North 26th Street in 1904. It has been a busy spring for Love City Inc. Love City renovated the gym in the Mackin building, hosting a grand opening ceremony for the neighborhood in March, then in May the Social Impact Incubator opened giving neighbors access to free high speed internet and a host of upcoming business, technology and entrepreneurship classes. Also in March Love City opened Porkland BBQ. Originally open only Wednesday through Saturday, on June 4 Porkland opened 6 days a week from Monday - Saturday. All proceeds from the restaurant go back into programs for the community. Come join us for some BBQ or fish and share some love!